A well-made education technology can work wonders in a controlled environment, but then fail in the wild because it imposes too great a burden on teachers. Here's how Speak Agent alleviates teacher burden. One classroom may have laptops for only half of the students or may find it difficult to access the computer lab on a given day. There must be alternatives. As a web app, Speak Agent runs on any modern web browser, regardless of operating system or device type—with no installation or IT support. That includes Chromebooks, Macs, PCs, netbooks, tablets (iOS, Android, or Windows), and interactive whiteboards. There are activities for classrooms (or labs) with 1:1 devices, activities for pairs or small groups sharing devices, and whole-class activities that a teacher may run on a projector connected to a teacher's device. Thus, if a classroom has a 2:1 student-to-device ratio, for example, the teacher can have students pair off and still use Speak Agent effectively. Students can even use a mix of different devices to access Speak Agent at the same time! Speak Agent is designed as a Swiss Army Knife toolkit. It has a tool or activity template for each type of learning strategy or learning mode. Most activity templates are designed to accommodate varied types of practice, from independent practice to co-learning on shared devices to guided practice using a projector. Independent practice offers more intensive practice and time on task. Paired co-learning opens up communication and role-based interactions such as writer-editor or speaker-listener. Small groups are great for creative projects and peer feedback. Whole-class, teacher-led activities provide opportunities to introduce new concepts and model language usage. Speak Agent also activities offer varying combinations of eight learning modes, such as auditory, textual, verbal, visual, and kinesthetic. Beyond the benefits of multimodal instruction, there are times when certain modes are impractical, such as when a projector is broken or when there are not enough working headphones. As little as 15 minutes per week of Speak Agent instruction can be highly impactful, as was found in an initial NSF-sponsored study of Speak Agent (Li, 2018). A higher dosage of 25+ minutes per week is likely to increase impact. Underpowered testing of Speak Agent with a top-20 public school district found that greater than 25 minutes per week was 50% more impactful than 15 to 25 minutes per week. Further increases in dosage may have an even stronger impact. We recommend 60 minutes per week as an optimal dosage, but there is broad flexibility in how you implement that across the marking period. Teachers at the elementary level are typically required to spend a certain amount of time on each of the core content areas (language arts, math, science, and social studies). Any education technology that does not align to the curriculum in these areas potentially displaces mandatory content time. By customizing to the curriculum and directly supporting acquisition of the specific academic language needed to access that curriculum, Speak Agent fits within the context of required instruction. It can be difficult to work technology time into the class schedule, particularly if the time needed to complete online tasks do not match up well with available time slots. Moreover, the school day can be unpredictable. Teachers need flexibility with how to implement the recommended dosage, both in terms of frequency and session length. Speak Agent provides digital lessons that offer a mix of short-form and long-form activities. Short-form practice activities can be accomplished in as little as 5 to 15 minutes. Long-form activities require higher cognition, integration of skills and knowledge, and/or collaboration and generally require 15 to 45 minutes. In the event a student cannot finish within the allotted time, all Speak Agent activities can be saved and continued later, in class or remotely. If teachers wish to use the recommended 30+ minutes per week dosage, they have many choices. They could, for example, run short-form independent practice each day in between larger scheduling chunks and then allocate one day a week for long-form activities. Or, they could pack it all into one day or any number of other possibilities. With other leading products, the content does not align 1:1 with the school or district's scope and sequence. Thus, the teacher must consider how and when she or he can adjust the lesson plan to incorporate the new resource. This is the opposite of how technology should work. The Speak Agent ALL platform is designed to have digital content fit seamlessly into each of your units of study. Each Speak Agent digital lesson comes with a ready-made, adjustable lesson plan that ties into the curriculum unit's key concepts and related vocabulary. There should be no daylight between the curriculum and the technology that supports it in terms of content, order, or pacing. It is all in your control. We support single sign-on with Clever and other middleware. Students use a simple four-digit PIN. Younger students use a visual password. Teachers get a PDF with all the login information for each class and student. Read a one-page case study from Manor ISD (near Austin, TX), as published in District Administration. 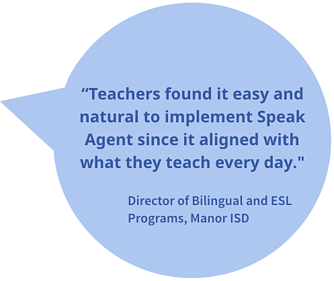 This implementation focused on Manor's elementary ELL population, with half of the group participating in an early-exit bilingual program and the other half in mainstream classes.